Dress up your Corvette with our Chrome - Button Kit. These trim pieces are designed to fit all 2005-2013 Corvettes over the existing screws and add a clean stylish look to your Corvette interior. Includes 60 pieces, enough to do entire car. Fits all 2005-2013 Coupe and Convertible Corvettes. Your kit comes to you with 60 chrome buttons and 60 sockets. This is more then you will need to complete this application. Save any extra parts in case you lose one. You have a choice of installation methods. You can either use method one or method two. Method 1 (PREFFERED METHOD)- The entire application can be done easily and securely by applying a small dab of clear household silicone from a small squeeze tube and gently place chrome cap into position. Be careful not to apply too much silicone as it will tend to ooze out of the sides. If this does happen leave it alone to dry. Once dry any excess can be pulled away cleanly. Method 2 - You have been provided with 60 white snap sockets. Simply remove the screw you are going to cover with a T15 torx driver and slip it thru the white socket, replace the screw being careful not to over tighten. Then snap the chrome cover in place. Be sure that it snaps in place. 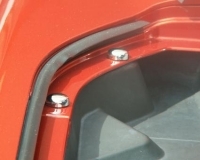 However some of the screw heads may be too large for the socket, in this situation either replace the screw with one that will fit the socket or simply use method one and silicone cap in place. 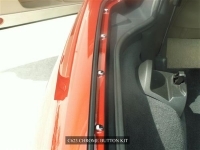 Log In To See Pricing 2005-2013 Corvette Convertible Polished Trunk Panel / Liner. Polished Stainless Steel Trunk Lid Panel for all C6 Convertibles. 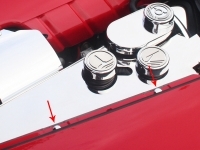 Log In To See Pricing 2005-2013 Corvette Chrome Trunk Lid Liner Fastener Covers - 2 pieces. Chrome caps to cover your factory screws. See more info. Log In To See Pricing 2005-2013 Corvette Hood Panel Set, 2 Pieces. Polished stainless steel hood panel insert plates. Fits C6 coupe or convertible.